In honor of the anniversary of Rosa Parks' refusal to move on the bus on December 1, 1955, thus setting off the chain of events that became the Civil Rights Movement, I thought it would be nice to pay a little homage to her and those who fought (and still fight) so bravely for the rights of African Americans in our country. Here is a fantastic title for middle-grade readers. Where and why: I got this book out of my local library. It was assigned reading for my children's literature class. This is the story of the brave freedom fighters in Montgomery, Alabama that spearheaded the Civil Rights Movement in 1960s America. It starts even before Rosa Parks played her pivotal role by refusing to give up her seat to a white man. After a brief introduction giving readers context of what it meant to be black during the 1950s, Freedman then begins with a lesser-known figure in history, Jo Ann Robinson, a professor at the all-black university Alabama State who, after being kicked off a bus for sitting too far toward the front, dedicated much of her time and life to changing the bus laws in the South. 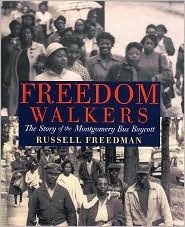 Throughout the book, Freedman continues to put the spotlight on forgotten and overlooked players that led to such a monumental shift in American history, along with well-recognized and essential names like Martin Luther King, Jr. and Rosa Parks. Freedman leaves nothing out in this history--everything is detailed, and he does not shy away from including the horrific murders that occurred before and after the boycott. Rosa Parks had not expected to resist on that December evening. And she did not want to put her family at risk. But she was no longer willing to accept the indignities of bus segregation, a system that dehumanized all black people. 'I decided that I would have to know once and for all what rights I had as a human being and a citizen, even in Montgomery, Alabama' [she said]. Short paragraphs, often broken up by black-and-white photographs that help tell the story, make it easier for younger readers to stay focused, yet it's not so simple that it would bore them. Quotes and the aforementioned photographs are woven into the text, both of which enhance the telling and give a sense of realness to it that would have been lost otherwise; as a result, the reader is transported back in time. All in all, this is an inspiring chapter in American history that Freedman tells eloquently, simply, and brilliantly. This looks like a good one. I feel like it's so hard to write a good, honest account about such a tumultuous time in American history that younger readers will understand. I feel some texts hold back soo much and don't portray the horrible injustices that were going on and then some just go WAY above the understanding of these younger readers. Sounds like you get to read some good books for class! Ditto what Jaime said -- and excellent review! Thanks! I did read some fantastic ones, though not a whole lot of nonfiction. This one was by far the best nonfiction one we read. I've recently found some more supposedly good titles about this era, so maybe I'll pick those up and see if they live up to their hype (from professional sources, I should say, not just us bloggers ;)).